Hi, I am interested in your 1987 Pontiac Firebird (stock #1719-TPA) listed on Autotrader for $23,995. I'd like to get more information about this vehicle and confirm its availability. You can probably bet the ultimate version of a famous sports car from a discontinued brand is going to be an expensive classic, right? 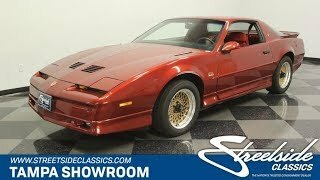 Well this preserved survivor 1987 Pontiac Firebird Trans Am GTA with ultra-low miles is the rare kind of coupe thats available at an obtainable price...for now. The GTA was the pinnacle of Pontiac performance of the 80s. It could be optioned with an engine related to the Corvette, and it received the biggest tires, biggest brakes, and the best full body kit, including rear wing, to represent all-out performance. 1987 was the first year they offered the now-legendary GTA package, and so you want one this well preserved. This car only has about 10,500 miles total, which is basically like driving it from our showroom to Daytona Beach and just once a year! In fact, they recently just buffed the factory Flame Red paint to make sure this shines like the well-respected survivor it is. More than just the original paint, this has all the best original standout features looking great, including the full ground-effects, special GTA badging, big rear spoiler, and the original vented hood that always looks so aggressive. But when a GTA is at the car shows, you know everyone is focused on those cool factory crosslace gold wheels... and these still have their original Goodyear Gatorbacks! Exceptionally low mileage also means little seat time, so the interior looks amazing. This full red package is loaded direct from the factory. It starts with the new bucket seats that include electronic inflatable bolstering for extra comfort in all conditions. Plus, you have power windows, power locks, keyless entry, power steering, cruise control, provisions for factory air conditioning, and an AM/FM/cassette stereo. The driver gets the three-spoke steering wheel with the proper GTA-specific badging. Beyond that are a full set of clear analogue gauges that look absolutely sporty. There was one option everyone looks for in the GTA, and its the Corvette-derived 5.7-liter L98. This fuel-injected V8 has been kept in original condition, and its believed to be original to this low mileage car. GMs 700R4 four-speed automatic transmission was a good paring because its stout nature can handle the power and torque produced by the upgraded engine. Plus, its quick shifting nature and overdrive setup, made it versatile for everything from street to highway use. But besides the drivetrain, the GTA was the king of the streets because it received the WS6 suspension. Sway bars front & rear, quick steering, and four-wheel disc brakes all meant that the GTA stayed on top of an enthusiasts wish lists through the 80s. This first-year Trans Am GTA has always been treated with the status it deserves. Its a highly original example of a head-turning classic offered for an obtainable price. So you know you need to hurry if you want to grab this deal. Call today!! !